Accomplished violinist Craig Thaler diversifies himself with his string trio, playing the music of the 1930's and 1940's swing jazz era and beyond. Craig's influences draw from 1930's hot club music of France - Stephane Grappelli and Django Reinhart - to a mix of modern jazz standards and originals. The unique string trio consists of violin, guitar and bass, however, any combination from a duo to a quintet can be designed to suit your needs. Craig is also available to join with other musicians on their projects. Music is offered for wedding ceremonies and receptions, bar and bat mitzvahs, special events, private parties, restaurants and clubs. Craig recorded with world-renowned bass player Jaco Pastorius on his final album, and has played with musicians including: John Hall and Orleans, Rick Danko and The Band, Commander Cody, Rick Derringer, David Johansen, Hot Tuna, jazz pianist T. Akioshi, jazz vibraphonist Karl Berger, and many regional artists. Craig provides private violin instruction to students of all ages, and can customize lesson plans for beginner to advanced instruction. Methods include Suzuki and Traditional. Craig also offers comprehensive music theory, including twentieth century harmony and improvisation. Genres of music instruction include classical, jazz, Irish and traditional fiddle. Craig attended Berklee College of Music, studying composing and arranging with Michael Gibbs. He graduated from State University of New York at New Paltz with a Bachelor of Arts in Musical Performance. 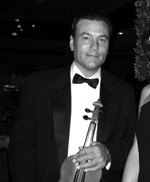 Craig is also a Violinmaker with the unique advantage of a keen ear for sound, as he has also been a professional violinist for 30 years. He learned to handcraft violins in the Italian tradition from world-renowned violinmaker John L. Rossi, and also acquired extensive experience in violin restorations and repairs. Craig's violins are suited for professional violinists or serious students looking for an upgrade that will serve them well as they pursue a professional career. Craig welcomes inquiries on a violin he currently has for sale.